It seems to be a well kept secret in the ham community: VHF+ contesting is a blast. If you live near a population center, like Western Washington or near Portland, OR, there is enough activity to make contesting easy and satisfying. The bottom line is that if you enjoy HF contesting, you should give VHF contesting a try. Try it, you’ll like it. You may end up loving it! The VHF contest season goes from June through January and is preceded by a “Spring Training” season. And Spring Training is just around the corner. So now is an excellent time to think about trying out VHF contesting. I’ve written this article so that it can be read from beginning to end, or used as a FAQ. Click on the links below to jump to a topic of interest. Or read it straight through. WHY PARTICIPATE IN A VHF CONTEST? HOW DO VHF+ CONTESTS WORK? WHAT CATEGORY AND FREQUENCIES DO I USE? WHAT IF I HAVE THE RIGS, BUT NO ANTENNA? WHAT ANTENNA POLARIZATION SHOULD I USE? WHAT OTHER THINGS CAN I DO ON VHF+? The proliferation of HF rigs that include 6m (now almost ubiquitous) and 2m and 70cm (common), as well as the availability of inexpensive FM equipment means that almost every ham has the equipment necessary to join in on VHF+ contesting. My objective in posting this article is to encourage you to give VHF+ contesting a try. This article focuses on the Pacific Northwest, as that is where I live and contest. I’ll try to persuade you to participate in at least one VHF+ contests this season and attempt to convince you that you can have fun in a VHF+ contest without making major financial, intellectual or emotional investments, and without the need to change your life for more than a few hours. I suspect that it only takes a bit of demystifying to make VHF+ contesting much more accessible to hams. My motivations are very simple. I want more people to participate in VHF+ contests. You see, I do these contests in the Limited Rover class. That is, I am a mobile station traveling from Maidenhead grid to grid, activating them, much like activating counties in a QSO party. When I change grids, I am, essentially, a new station, and therefore a new QSO and possibly a new multiplier for other stations. More people means more activity in the contest, and that translates into more contacts and more fun for me and, really, everyone else. That, and I like to win contests. More activity means a higher score, so there is that rather less altruistic reason for this article…. Most of what follows is about operating from a fixed station. The photos, however, show rover or portable activity only because those are the photos I have. Radiosport. One motivation is, simply, competing in a contest. What is nice about VHF+ contests is that they don’t have to occupy your entire weekend or disrupt your sleep. The activity is less intense, with occasional bursts as new stations show up or as rovers reach new grids. Emergency readiness. When I got started in VHF+ contesting one of my motivations was a desire to build and test my capacity for mobile and portable operations. You know…the same thing that motivates many thousands of us to go camping with our radios or operate from home by battery power during the last full weekend of June. Many contests and operating events have a tradition in public service—specifically, practice in traffic handling (Sweepstakes) and emergency readiness (Field Day). Contests at VHF and above are frequently (but not always!) limited to local and regional communications. So, VHF+ contests effectively serve as a communications exercise for a local or regional disaster scenario. Nearly every ham seems to have some VHF or UHF FM equipment buried in a drawer or perpetually sitting on a shelf, perhaps in a charging cradle. I’ll go out on a limb here and claim (without actually doing the research) that much our acquisition of VHF FM gear is motivated by emergency readiness. We know either explicitly or from early socialization that our access to valuable chunks of RF spectrum is, in part, “[r]ecognition and enhancement of the value of the amateur service to the public as a voluntary noncommercial communication service, particularly with respect to providing emergency communications” (47 CFR 97.1(a)). My point is that VHF+ contests can be thought of as an emergency readiness exercise. It’s the perfect opportunity to dust off underutilized equipment—recharge the batteries in that HT and put it on the air to see just far and how effectively you can make it work without using repeaters (which might not be available in the aftermath of a disaster). In fact, as of January 2013 the ARRL has added a new “FM Only” category to the VHF contests. Entrants for this new category use up to four bands: 6 meters, 2 meters, 223 MHz, and 446 MHz. Power is limited to 100 watts or less. The new “FM Only” category makes getting involved in VHF+ contests even more appealing. It removes any stigma—perceived or real—of using FM in a contest traditionally dominated by die hard weak signal operators. As a die hard (though relatively new) VHF+ contest participant, my impression is that the stigma is not real. I am just as happy to work someone FM as I am SSB or CW. In fact, I typically monitor, and occasionally call CQ on the “standard” FM simplex frequencies. I always end up with few FM contacts on 2m or 70 cm. Each one brings a smile to my face. On 222 MHz the only simple way of getting on the band is with FM equipment, so even diehard weak signal types usually use FM on the 222 MHz band. Even though I contest with all-mode capabilities on the band, most of my 1.25m contest QSOs are FM. Dusting. Another motivation is simply to dust off that old FM or satellite equipment and get it on the air occasionally. Or make sure the 6m capabilities of your HF “daily driver” are in order. “I’ll be busy that weekend trying to crack the pile-up for the Fernando de Noronha DXpedition.” Fine. But you can do both…and do ’em pretty much simultaneously. VHF contests are unlike most HF contests in a number of important ways. First, contest activity tends to be quite patchy. At the start of the contest there will be a burst of activity as everyone tries to work everyone. Once that’s over (typically less than an hour or two), there will be smaller bursts of activity on account of new stations that pop up and rovers that change grids. The pattern of activity makes it easy to multi-task—work some DX, build that new Elecraft kit, or watch the ball game, all while participating in the VHF contest. The exception to this burst model of activity can occur during summer VHF contests when sustained 6m openings occur. In that case, contest activity will switch almost entirely to 6m SSB and CW for the duration of the opening, which can last from a few minutes to many hours. When the magic happens, the 6m band sounds more like 10m during a contest with an opening. Six meter openings can be as thrilling as any HF contest. If nothing else, you can make great progress on your 6m Worked All States endorsement. A second difference is that you will not have to pull an all-nighter. Contest activity is possible, but nearly non-existent, from 11 pm to about 8 am. This is almost true. The gonzo weak signal fanatics may be attempting to bounce signals off the moon when it is around, or off of ionized trails created by meteors late at night or early in the morning. Everyone else gets a good night’s rest. Like almost all contests, the goal in VHF+ contests is to contact as many unique stations as possible on each band and get as many multipliers as you can. But unlike most contests, mode doesn’t matter. If you work a fixed station on 6m FM, you don’t get additional points for working that same station on 6m CW. The multipliers in VHF+ contests are maidenhead grids. In fact, your four-character grid is the contest exchange; RST is optional and usually not sent. CN87 – To give you an idea of the size, the upper right-hand corner of CN87 is a few miles east of Lake Stevens and the lower right-hand corner is just west of Hoquiam. If you live in the greater metropolitan Seattle area, chances are you live in CN87. CN88 – To the north, CN88 extends from the same spot near Lake Stevens, and goes north to the border. The upper left corner is just west of Ladysmith, B.C. on Vancouver Island. CN97 – The upper left corner is that spot near Lake Stevens. The lower left corner is near Carbonado, WA near Mt. Rainier. Most of the grid is in the Cascades, extending as far east as Chelan. Mountain-top expeditions to CN97 are common during contests. The eastern-most portions of Redmond are in this grid. CN98 – This grid is largely in the Cascades north of CN97 and east of CN88. Granite falls is the only nearby population center in the grid. Mount Pilchuck, and Green Mountain just to the north of Pilchuck, are popular mountain-top expeditions for CN98. CN89 – This grid extends north of the Canadian border and includes the great Vancouver area as well as parts of Vancouver Island. An enthusiastic group of Canadian VHF contesters keep this grid on the air during contests. Perhaps because of surveying errors, the grid line between CN88 and CN89 is in Washington state. One can activate CN89 without leaving the U.S. by sitting in the parking lot of the Peace Arch Park in Blaine, WA. CN86 – The upper right corner is near Carbonado and extends southwest down to Seaside, Oregon. 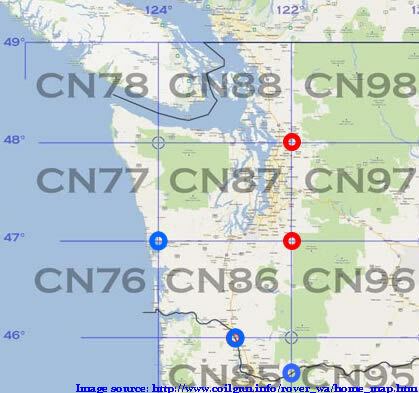 CN96 – This grid is mostly in the Cascades south and east of Mt. Rainier. But it is often activated for the Puget Sound region by rovers from a 3,000′ foot accessible gravel road from just northwest of Mt. Rainier. CN85 – This grid is south of CN86 and includes Vancouver, WA, and the entire Portland metropolitan area. CN76 and CN77 – These grids are mostly in the Pacific Ocean. But the western-most portions incorporate Ocean Shores. Both grids are usually activated by rovers from Ocean Shores during contests. If you don’t know your own maidenhead grid, you should be able to find it on your QRZ page. One caution is that QRZ sometimes has the wrong grid listed. A better way of finding your grid is to find your QTH on this map. Zoom in on and click on your QTH. Jot down the first six characters. For example, clicking on my house gives CN87WQ. Most contests only require the first four characters, but it is useful to know the first six. High Power (1500 W). Got QRO? Low Power (200 W on 50 and 144 MHz, 100 W on 222 and 432 MHz, 50 W on 902+ MHz). This is the category used by many participants. Most stations will have SSB capabilities on 6m, 2m, and 432 MHz. Some stations have 222 MHz all-mode capabilities; even more will be on 223.5 MHz FM. Portable (10 W or less, portable power source and antennas). For the Pacific Northwest, this class is ideal for hikers and people interested in SOTA. There are great opportunities for portable stations. 3-Band (6m, 2m & 432 MHz only at 100 W, 100 W and 50 W respectively). This is ideal for people with HF rigs that also do 6m, 2m, and 70cm—like the FT-897, FT-857, IC-7000, IC-706mkII, and TS-2000. Folks with HF+6m rigs and a separate dual band FM transceiver can do this category, as well. This category seems underutilized, and is ripe for regional records and top scores nationally. If you enter in this category, you may well win some wall paper. FM Only (6m, 2m, 222 MHz and 446 MHz, 100 W or less). This category is ideal for folks with a pile of FM rigs begging to be used. If you already have capabilities for 6m, 2m and 70cm FM, you can add 222 MHz FM for a bit over $100. And 223.5 MHz FM is quite active during contests. This category also seems underutilized and probably is ripe for picking off records and top finishes nationally. With a category in mind, we can talk frequencies to use. 1.8.Use of the national simplex frequency, 146.52 MHz, or immediately adjacent guard frequencies, is prohibited. 1.8.1.Contest entrants may not transmit on 146.52 for the purpose of making or soliciting QSOs. 1.8.2.The intent of this rule is to protect the national simplex frequency from contest monopolization. 1.8.3.There are no restrictions on the use of 52.525, 223.50 or 446.000 MHz. Participants are, however, encouraged to not monopolize the calling frequencies throughout the contest period. 1.9.Only recognized FM simplex frequencies may be used, such as 144.90 to 145.00; 146.49, .55 and .58, and 147.42, .45, .48, .51, .54 and .57 MHz on the 2-meter band. Don’t forget to set the rig(s) for simplex on these four frequencies. If one of the frequencies gets too busy, it would be useful to have the capability to QSY to nearby frequencies. For two meters only, you would need to QSY to a “recognized FM simplex frequenc[y]” except for 146.52 MHz. In practice, this means programming a few alternative frequencies into your 2m rig. The Pacific Northwest uses 20 KHz spacing on 2m, so some potential nearby simplex frequencies include 146.42, 146.44, 146.46, 146.48, 146.50, 146.54, and 146.56 MHz. Also, in the Pacific Northwest, 147.54 MHz is a commonly used simplex frequency. Finally, I recommend adding 144.90, 144.92, and 144.94 MHz if your antenna will let you work there. Here’s the reason. At times, you may work somebody on, say, 6m and ask them to QSY to 2m (“running the bands” is an acceptable and common practice during VHF contests). They may tell you that their 2m antenna doesn’t work up on 146.58 MHz. In that case, ask them to QSY to 144.90 MHz, which is a recognized simplex frequency written into the ARRL’s General Rules for Contests Above 50 MHz. Chances are their antenna will be able to handle that. This is rather theoretical…I know of no one who has actually worked stations this way, but it is a viable option for stations with 6m all-mode capabilities and FM only on higher bands. One last thought on using FM in the FM Only category. In two years, I’ve only ever worked one station on 52.525 MHz FM, despite having a dedicated 6m FM rig on its own vertical antenna during every VHF contest. So it might be unrealistic trying to work a lot of stations on 6m FM on the calling frequency. The lack of activity on 6m FM likely discourages folks from entering as “FM Only”, particularly if they have 6m SSB capabilities. Here’s an idea for such folks to boost 6m FM QSOs significantly. Lure SSB stations into a nearby 6m FM QSOs by going to the SSB calling frequency, 50.125 MHz, and making an SSB CQ: “CQ Contest from WW7D going up to 50.325 MHz FM.” That is, announce your nearby FM frequency on the SSB calling frequency, but do not make any SSB QSOs. This does not seem to violate the contest rules. I’ll bet one could easily break scoring records in the FM Only category by doing this. After working stations on 50.325 MHz FM, run the bands up to 432 MHz. And if you have SSB/CW capabilities on the 2m, 222 MHz, and 432 MHz, do the same thing on those bands. An alternative is to first work stations on 223.5 MHz FM and ask them to QSY to 50.325 MHz FM. After a few such QSO/QSY combinations, word will get around and you’ll find stations hunting for you. I use 50.325 MHz as an example, and 50.3 MHz — 50.6 MHz is an acceptable place for FM according to the ARRL Band Plan. The band isn’t always used the way the ARRL Band Plan specifies, so make sure 50.325 MHz (or wherever you go) is not being used for something else. Watch out for digital work at 50.3 MHz. If the FM Only category catches on and activity levels warrant it, these same practices should be used. Wire antennas (dipoles or delta loops) can be built in an hour or two and can be saved as part of an emergency go-kit when not used for contesting. Directional antennas might require an evening or two to build. A two-element Moxon is an easily-built gain antenna for 6m. Remember the quagi? These are quite easy to construct for 2m and above. My favorite is the “cheap yagi” series of antennas. The WA5VJB recipes work very well and the antennas are truly inexpensive and easy to build. Weak signal operators usually use horizontal polarization, whereas, vertical polarization is more common in the FM portions (except, perhaps, on 223.5 MHz FM where horizontal polarization is commonly used). My advice is simple: Use what you can. Whatever it is, it will largely work. Yes, I know there are many dBs of loss for stations using incompatible polarization—theoretically an infinite loss. In practice, the loss is much less. One thing for sure, staying off a band for want of the “correct” polarization is, effectively, infinity dBs of loss! When roving from my car, I’ve used vertical antennas for SSB while in motion. Contacts still happen. Sometimes I’ve had to pull over and work a pile-up on my vertical antennas before arriving at my destination where horizontally polarized antennas would be deployed. ARRL June VHF Contest. This occurs in the middle of June, a couple of weekends before Field Day. In 2014, the contest is from June 14-16. The contest is for all bands from 6m up. CQ World Wide VHF Contest is for 6m and 2m only and is held on the 3rd weekend in July. For 2014 the contest is scheduled for July 19-20. ARRL August UHF Contest. This contest covers 222 MHz and above and happens in early August. In 2014 it takes place on Aug. 2-3. These events are a great way to test out changes to your station in preparation for upcoming contests. They are informal, friendly and can be used to get a bit of contesting experience before committing to a longer contest. There are numerous additional contests that use some or all of the VHF+ bands: There are EME (moonbounce) contests, a 10 GHz+ contest, a six meter (SMIRK) contest, and some regional VHF contests. Many state or regional QSO parties include VHF+ bands. In Washington State, the Salmon Run includes 2m and 6m, as does the 7th Call Area QSO Party, the CA QSO Party, and the Arizona QSO Party. The Montana QSO Party allows 6m, 2m and 432 MHz (but, apparently, not 222 MHz), and the Nevada QSO Party (Mustang Round-up) allows 6m. The RAC Canada Day Contest includes 6m and 2m. VHF contests offer a number of interesting possibilities beyond working from a home station. Going portable: The Pacific Northwest offers numerous fascinating possibilities for doing this. The basic idea: Go to a high, easily accessible location that has an unobstructed view from Vancouver, B.C. to Vancouver, WA to Salem, OR. Of course, few locations that truly meet all three of these criteria (e.g. The top of Mt. Rainier almost works, but falls short on the “easily accessible” criteria), but do the best you can. Operations can be field-day like multi-band big-antenna efforts or QRP mountain top efforts. Or just drive to a high spot and work out of your car for part of a weekend. Roving: This is another interesting activity that offers DX-like pile-ups and travels through some great scenery. A thorough discussion requires an article of its own. You can read lots of stories of roving the Pacific Northwest at my blog. Barry, K7BWH, has a wonderful web page full of rover locations worth considering. I’ll just mention that the Limited Rover class (limited to the bottom 4 bands) is the great equalizer. One can put together a very competitive station with a modest investment of equipment and sweat equity. One key to a successful rover station is an ability to rapidly set-up and take-down a set of modest directional antennas. The other key is smart planning—success comes from a good route with great portable locations along the way. Microwaves: I’ve mostly focused on 6m through 432 MHz in this article. But there are many bands above 432 MHz. The two most accessible are 33 cm (902 MHz) and 23 cm (1296 MHz). These bands see a fair amount of SSB/CW activity during contests, primarily on 903.1 MHz (or 902.1 MHz in some regions) and 1296.1 MHz CW and SSB. There are a few rigs that do all modes on 23cm (e.g. TS-2000X, IC 1271, IC 910H with 1296 module, or the FT-736R with 1296 module). The other option for 1296 MHz and, really, the only practical option on 902 MHz, is a transverter. This obviously moves contesting up to a new level of complexity and commitment. It makes for an interesting technical challenge. An option for these bands is FM, and FM can successfully be used in these contests. There are a number of ham rigs that do 23cm and 33cm FM. At 33cm, there are plenty of inexpensive commercial rigs that can be made to work in the ham band. A refurbished Kenwood TK-981 can be picked up on Ebay for ~$120 and is very easy to program for FM simplex frequencies. The TK-941 can be picked up even cheaper—unlike the TK-981, the TK-941s don’t work well for repeaters, but work very well as a simplex contest rig. Motorola and GE make commercial rigs that can be modified for 33cm with more effort. Most commercial gear can’t easily be made to work simplex at bottom of the band (i.e. near 903.1 MHz) without modifications. They can be programmed without modifications for the national simplex calling frequency of 927.5 MHz. I’ve found modest activity on this frequency during UHF contests and field day. Since QSOs on these bands are worth much more, even a few 927.5 MHz contacts really add up. At least one in-production ham rig, the Alinco DJ-G29T, can go somewhere near the SSB calling frequency of 903.1 MHz. A couple of regional hams have used 903.2 MHz FM to successfully work folks with transverters during contests. If people know you are there, they will find you. There are a few mobile (e.g. Kenwood TM-531E) and a handful of hand held 23 cm FM rigs. I’ve had great success with the Alinco DJ-G7 (currently in production). Most of my QSOs have been with SSB stations that are willing to move to FM on nearby 1296.2 MHz, rather than the national FM simplex calling frequency 1294.5 MHz. That frequency is out of range for most transverters. And beyond: VHF contesting is a gateway drug to other exotic ham radio activities like moon bounce or meteor scatter. How about going for a WAS endorsement on VHF? Or even VHF DXCC? One interesting activity on VHF is VUCC earned by working 100 maidenhead grids (or fewer on bands above 2m). The Pacific Northwest VHF Society offers the Lewis and Clark Grid Exploration series of awards for working or activating all of the grids each state or province—Washington, Oregon, Idaho or British Columbia. The ultimate challenge is to work all 488 maidenhead grid in the Continental U.S. to earn the Fred Fish Memorial Award. If wall paper isn’t your thing, how about DXpeditions? Go out and activate a rare grid for other hams to complete their awards and become a hero in the process. The possibilities are endless. Closing Thoughts: There are plenty of reasons to join the contest activities on VHF and above. Most importantly, it’s fun. Entry into the activity is quite easy—you probably already have the equipment. As a bonus, you meet a great group of hams who are encouraging and eager to help you out. And don’t forget to send in a log, no matter how few contacts you make—you might just earn a piece of paper. Say…like K1ZK, who earned a certificate in a VHF Contest with one QSO! Even if you are not convinced to spend the weekend contesting, the next time a VHF+ contest rolls around, show up on 50.125 around mid-day on Sunday. Enjoy your pile-up! Be careful, though. Once you start playing in VHF+ contests…you might not be able to stop! Many members of the Pacific Northwest VHF Society have provided excellent advice and great insights. I thank Gabor, VE7JH, Eric, N7EPD, Paul, K7CW, and Mike, KD7TS for their helpful mentoring as I got started in VHF contesting. Etienne, K7ATN, provided a number of helpful comments and suggestions for a revised (3 Apr 2014) version of this post. Great article enjoyed the read and working you on the Sprint this evening came across your site while looking up your call 73 and hope to work you again. Thanks…it was nice to meet and work you, too. You had an excellent signal—I wouldn’t have expected Sequim to be so strong, particularly from my CN87 location. I look forward to working you in the other sprints, as well.